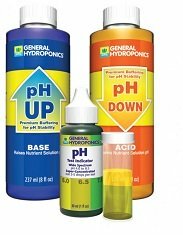 Are the effects of low pH in a hydro system realy bad? Answer: The main concern with pH is nutrient availability. If nutrients are not available, the plant cannot take them up and use them. In general, having your pH a little too low and allowing it to float back up into the appropriate range is not a problem. Of course, this is only true to a certain point. At some point you make the pH of the solution acidic enough to do permanent damage to the roots of your plants. If that happens, you will certainly know about it....all of your plants are likely to die. I used to have a friend who would mix his nutrients up at a pH of 5.2, knowing the pH would float up over time and require correction. He swore he never had any problems as a result of the low pH, but every plant and every strain will behave a little different. Keeping that in mind, take a close look at the nutrient availability chart below. 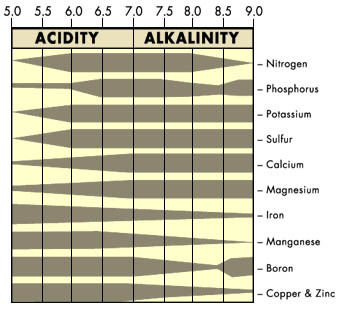 Several nutrients quickly become unavailable as the pH of the soil (or nutrient solution) go either below 5.8 or above 6.8 very much. If you operate your hydroponic system in these ranges for too long, your plants will begin to display symptoms of nutrient deficiencies. This is true even if all the nutrients are present! If you find you are running your nutrient solution outside of the ideal pH range quite a bit, you should seriously consider using a nutrient supplement that contains some humic acid, fulvic acid, or both. These substances help to keep nutrients chemically available to your plants even though pH levels may be outside of the ideal range. For more detailed information on how to maintain your nutrient solution properly, be sure to check out my how to grow hydro page. I hope this helps you out Mary, and Happy Growing!